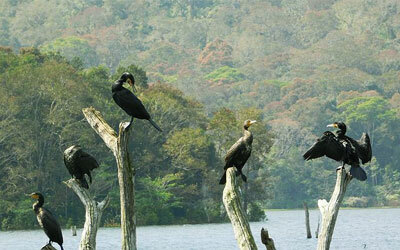 In the banks of Periyar Lake lays the pride of Kerala – The Periyar Wildlife Sanctuary and National Park. This is a protected area placed in the Idukki and Pathanamthitta districts of Kerala. The sanctuary which borders with Tamil Nadu is located in the Cardamom and Pandhalam hills in the Western Ghats. The wildlife sanctuary is also famous for its tiger reserve and elephant reserve. Out of the total protected area of 925 sq km, the 350 sq km was declared as a national park in the year 1982. Often this park is addressed as either Periyar wild life sanctuary or Thekkady. The history of the Periyar Wild Life Sanctuary and National Park is closely related to the construction of Mullaperiyar Dam. The construction of the dam across the Periyar River led to the formation of Periyar Lake in the year 1895. In 1899, the forest surrounding the lake was declared as Periyar Lake Reserve Forest. Later in 1950, the forest was expanded to the Periyar Wildlife Sanctuary. With the launch of Project Tiger 1978, authorities began to think about the importance of protecting the endangered species. The wildlife sanctuary was well known for its tiger population. Considering this, the sanctuary was bought under the Project Tiger mission and was made the 10th Tiger Reserve in India. When the Project Elephant mission was launched in 1991, the sanctuary was also declared as an Elephant Reserve too. Visiting the sanctuary will be like exploring the nature around, enjoying the pristine and peaceful atmosphere around and getting relaxed from your busy schedules. Periyar wildlife sanctuary is famous for its rich flora and fauna. The forest here is tropical evergreen and moist deciduous. You can see here teak, rosewoods, sandalwoods, mangoes, tamarinds, banyans, bamboos etc. Entering deep into the forests, you will be able to sight around 35 species of mammals like Bengal tiger, Indian elephant, gaur, sambar, wild pig, Indian giant squirrel, jungle cat, Nilgiri tahr, lion-tailed macaque etc. The sanctuary is also unique with its bird population. Around 265 species of birds are present here. Common birds like Malabar grey hornbill, Nilgiri wood pigeon, Nilgiri flycatcher etc are seen here. If lucky you may be also able to watch rare species like black baza, Nilgiri thrush, little spiderhunter, brahminy kite, great hornbill etc. Lots of activities are organized inside the Periyar Wildlife Sanctuary. You can enjoy the wildness with a trekking programme. The programme is arranged from morning 7 am to evening 3 pm. Other activities are jungle patrol, bamboo rafting, jungle inn, jungle camp, border hiking etc. 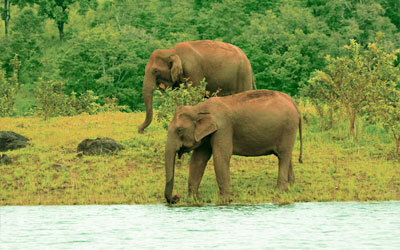 Ideal time to visit the Periyar Wildlife Sanctuary is from October till June. After the heavy monsoon it will be difficult to sight the wild animals as there will be enough water inside the jungle itself. You can sight them outside during dry season as they will come out in search of water. The nearest town to the sanctuary is Kumily (4 km). 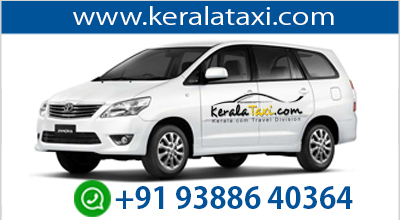 Adequate bus services are available to this town from Ernakulam, Kottayam and Madurai cities.